Stop assuming that Fox, in any of its iterations, is going get something right. So instead of using this early leak as a way to let the public hype up the game and drive people towards it, they decide to stifle people's impressions of the game and now they foster apathy towards Fox itself and the game. Obviously marketing and PR is not in their corporate mantra, but doing something detrimental is. ...Fox is fuckup waiting to happen whether Murdoch has his hands in it or not. This should be something that clearly violates the DMCA process. No problem. When they get it right and want to release it for sale I promise you I won't be one buying it. I don't want my money going to corporations that act like this. If they'll do it once they'll do it again. I don't support such actions as these. Re: Some corporations just want to be hated. we are talking about fox here. I have yet to see anyone like them. I fight the only way I am able to... I don't watch Fox News, in fact I don't watch Fox network at all. And I refuse to buy any video game they are associated with. Wish I could do more to make them realized how stupid they are looking. Fox... fair and balanced NOT! This makes sense when you think about it. 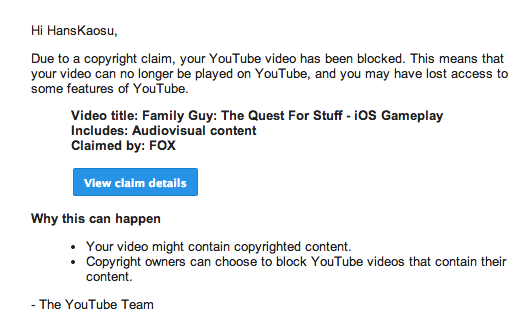 If the use is fair use, then it isn't in violation of copyright regardless of who owns the copyright. It's Fox. Fat guys are entitled to hot chicks if they are the protagonists. Other fat guys are not, or something. I've never been able to figure it out. See also "lovable loser, and WTH is that not an oxymoron?" I do like the show, though sometimes it's more miss than hit.